i was recently sent some product from Eye Majic to test out. it is an eyeshadow applicator which is intended to apply your eyeshadow in one simple swipe. having heard of these before i was eager to give them a try. the concept sounds interesting and i like the simplicity of it. after receiving them and trying them out, i am a little less enthusiastic. 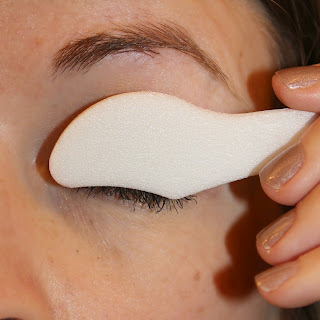 shown above are the Eye Majic applicators. 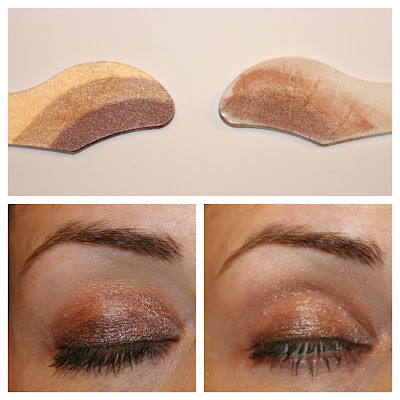 you can see how the shadow looks on the applicator before applied and after it has been applied. i first applied the shadow to my eye and wasn't thrilled with the way it looked (above left). i decided to take a fluffy brush to the eyeshadow in the hopes of blending the colors together and ended up with a blurry mess (shown above right). nice to meet you disappointment, my name is kristie. the concept is appealing but the actual design isn't as impressive. the biggest problem i found is that the eyeshadow is applied to such a limited area. i still had empty space from crease to brow that needed to be filled. the one product from Eye Majic that i found to be a win were the animal print shadow applicators. animal print is tricky and something that i think would be difficult to achieve with eyeshadow alone. if i were going to select a product from this line, that would be my choice. if you have tried this type of product and had better results i would love to hear. Doesn't one of the drugstore companies (Maybelline maybe?) have a similar product available? I wonder if it has the same problems. I thought this concept seemed familiar, probably because one of the larger brands does offer it. The company sent the suggestion of blending with the edges of the applicator rather than a brush. Next time I will have to try that route.